Tickets must be purchased for MR. FISH. Co-featured with MR. FISH: CARTOONING FROM THE DEEP END; please see separate listing to purchase tickets. From comic strips to cosplay, Harleen Singh’s film finds encouraging signs of progressive change in forums once solely devoted to juvenile entertainment—and to a middle-class WASP perspective. Her primary subjects are three distinctive artist personalities. Keith Knight has used newspaper strip “The K Chronicles” and other ongoing outlets to sharply yet humorously critique racial issues, not least police violence against African Americans. 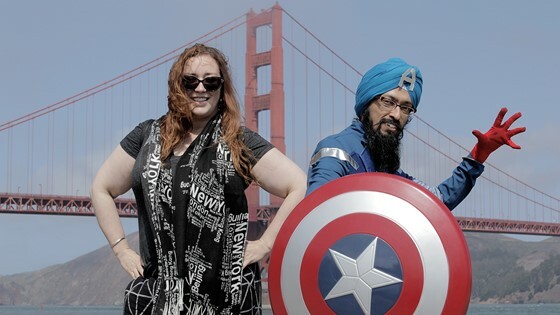 In response to heightened hostility towards minorities after 9/11, Vishavjit Singh began creating editorial cartoons—then extended his ideas to wearing a Captain America costume in public, the “altered” image invariably stirring discussion thanks to his Sikh beard and turban. Eileen Kaur Alden is a confessed lifelong nerd girl whose combined feminist beliefs and love of superhero-style adventure led her to co-create the comic book series “SuperSikh.” The boundaries of representation are changing—even in the “funny papers,” even amongst spandex-wearing champions of truth and justice. Thank you to our community partner Marin Arts. 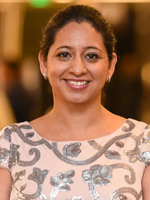 Born in Wellington and raised in 17 cities across India and the US, Harleen Singh began her career at The History Channel and National Geographic Channel. Her films have been well received at various film festivals across the globe. She has also been a jurist for the United Nations Association Film Festival (UNAFF) for the past 4 years. Singh holds an MBA and a Masters in Strategy.